As it happens, that is an apt description of those of Her Majesty's Treasury (HMT) officials charged with monitoring government spending departments. It's also decent philosophy for equity investors. On 17 November Casino Royale opens. 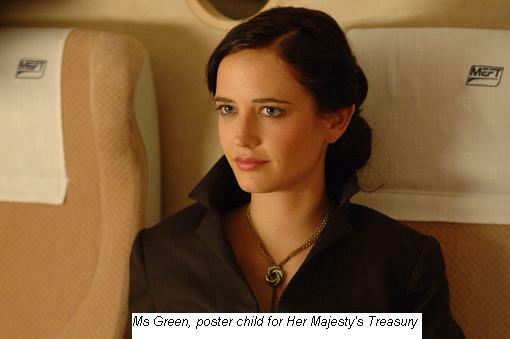 Notably, this episode of the Bond saga has a starring role for an official of HMT, portrayed by Eva Green. And Ms Green puts on a first-class performance as a Treasury woman. Or at least as it might be imagined by those Treasury men whose favourite lunch time activity remains the strolled tart-of-the-day spotting contest in St James' park whilst en route for a pint at the Two Chairmen public house. But why quibble? Ms Green brings long overdue glamour to HMT's work. There w as always the thrill of working behind bomb-proof curtained offices; the mystery of ancient wall safes whose combinations have long-been forgotten; the warren of below-ground rooms from which historic items are periodically retrieved and displayed in HMT's entrance hall (swords were a favourite during this scribe's tour); and, not to be forgotten, the excitement of preparing and delivering ministerial briefings (exemplified by useful contributions from the Foreign Office such as describing a visiting overseas finance official as being “tall for an Asian”). Now the world knows, too, that HMT personnel also hit the streets. Thanks, Ms Green. Even your correspondent can say, without remotely risking running foul of the Official Secrets Act, that he had occasion to enter the MI6 building south of the river (with the Bond theme tune running through his head and his heart beating quicker). Nice views. Unfortunately, Ms Green lets the side down in one respect. She falls prey to “agency capture” for HMT-style monkdom is not for everyone (especially when compared to Bond-style monkdom). A good controller - and investor - must maintain a careful detachment. Just never apply this to making a Bond film. USD: Thanksgiving hangover or reality check? Saul, Saul, why do you persecute me?